Colin Mills was installed as the new WM of Tarleton Lodge No 7871 at the Park Hall Hotel, Charnock Richard. The lodge was honoured by the presence of the Deputy Provincial Grand Master Philip Gunning, attending as the principal guest. Philip was accompanied by Assistant Provincial Grand Master Frank Umbers, Ormskirk and Bootle Group Chairman Graham Chambers, group vice-chairman Malcolm Alexander, grand officer Brian Fairhurst, Provincial Deputy Grand Director of Ceremonies Mark Barton and the acting Provincial grand officers Russell Morris and Jason Dell. Pictured are: Philip Gunning (left) with Colin Mills. The outgoing WM Stephen Dunn opened the lodge and once the initial lodge business had been completed, Mark Barton was admitted into the room and announced that Philip Gunning was present and demanded admission. 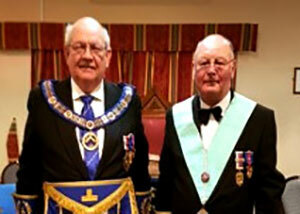 He was then admitted into the temple accompanied by the grand and acting Provincial grand officers. Stephen warmly welcomed him to the ceremony and offered him the gavel of the lodge, which Philip gracefully declined. Stephen asked David Greenwood if he would assist the lodge by occupying the chair of senior warden, Thomas Ryding if he would occupy the chair of junior warden and Eric Price if he would assist by acting as inner guard. The master elect Colin Mills was then presented to the lodge by the presenting officer James Wright and after Colin had taken his obligation, the outgoing WM thanked the brethren for all their support and hard work they had given him during the last two years. Stephen then installed Colin according to ancient custom into the chair of King Solomon. The working tools for the third degree were presented by John Webster, the second degree by Raymond West and the first degree by Russell Morris all in a confident and proficient manner. During the installation of the officers of the lodge the address to the deacons was given by Andrew Newson, the address to the stewards was given by David Greenwood and the address to the tylor by Andrew Newson. The address to the wardens was given by Russell Morris and the address to the brethren of the lodge by principal guest Philip Gunning. At the end of the ceremony Philip brought congratulations on behalf of the Provincial Grand Master Tony Harrison. Congratulating Colin on becoming WM, Philip then thanked and congratulated Stephen for the way he had installed Colin into the chair and all the brethren of the lodge who had been involved in ceremony. Philip was then presented with three cheques on behalf for the following beneficiaries; £300 MCF 2021 Festival, £250 to the North West Air Ambulance and £250 to the Royal British Legion Poppy Appeal, for which he gave grateful thanks on behalf of all those who will benefit from the kind generosity of the members. Following the meeting the brethren made their way to an excellent festive board held over in the Park Suite of the hotel, where the evening’s celebrations continued. Pictured from left to right are: Jason Dell, Graham Chambers, Frank Umbers, Philip Gunning, Colin Mills Stephen Dunn, Malcolm Alexander, Russell Morris and Mark Barton.